Considering the 2017 Chevy Colorado is the “smallest” of the brand’s offerings, it shouldn’t be all that surprising to learn that the model is often relied on as a daily commuter. Well, that probably explains why engineers cleverly filled the vehicle with a number of appreciated technological features. It starts with the brand’s MyLink system, which is accessible via the eight-inch diagonal color touch-screen display. Thanks to this feature, drivers can access a number of useful applications that will assist them during their commute, and they can enjoy all of their favorite radio stations. Thanks to the inclusion of Bluetooth connectivity, drivers can also make hands-free phone calls, resulting in optimal safety. Meanwhile, the Apple CarPlay and Android Auto compatibility means drivers (or passengers) can seamlessly connect their smartphone to the Colorado’s MyLink system. This way, you can enjoy all of your favorite songs, access your preferred navigation system, or even send text messages! This offering doesn’t only boost convenience and entertainment, but it will also play a significant role in keeping occupants safe. The technological offerings don’t end there. The vehicle contains built-in 4G LTE Wi-Fi, which means up to seven devices can enjoy the convenience of wireless internet. For those who need to complete work while on the road, this will ultimately turn into an essential inclusion. Meanwhile, the myChevrolet Mobile Application makes it incredibly easy for owners to remotely access their pickup. Colorado owners can lock/unlock the doors, operate the engine, view any important vehicle diagnostics, and even send detailed maps directly to their navigation system! It’s rare to see a regular sedan offering three potential engine choices, much less a hulking pickup truck. Well, that’s a big reason why the 2017 Chevy Silverado 1500 is considered one of the most impressive vehicles on the road. The 4.3-liter EcoTec3 V6 engine provides extraordinary power specs considering it’s coming from the vehicle’s smallest offering, as drivers can expect 285 horsepower and a best-in-class 305 pounds-feet of torque. As a result of these impressive numbers, owners can anticipate a towing capacity around 7,600 pounds. Meanwhile, thanks to the inclusion of fuel-saving technologies like Active Fuel Management, Direct Injection, and Continuously Variable Valve Timing, owners can rely on an impressive 18 city/24 highway mile per gallon fuel efficiency. Drivers will find a bit more power from the 5.3-liter EcoTec3 V8 engine, as the system cranks out 355 horsepower and 383 pounds-feet of torque (resulting in an equally-impressive 11,100-pound towing capacity). Despite all of the muscle, the vehicle is still fuel efficient, as drivers can anticipate a best-in-class 23 miles per gallon on the highway. Finally, the 6.2-liter EcoTec3 V8 engine is for those seeking the utmost power. This hulking unit is capable of pumping out 420 horsepower and 460 pounds-feet of torque, which should be more than enough muscle to overtake any of your fellow drivers on the highway. Predictably, the uptick in power results in an uptick in towing capacity, as the vehicle is capable of hauling a best-in-class 12,500 pounds. Finally, the pickup truck delivers a rather impressive 15 city/21 highway mile per gallon fuel efficiency. Considering the power of the Silverado 1500, it’s not shocking that the 2017 Silverado 2500 is just as capable (if not more so). Well, Chevy’s engineers cleverly accounted for this, and they added a number of useful driver-assistance technologies to improve the vehicle’s handling. For instance, the Digital Steering Assist will make it incredible easy for the driver to control their pickup, especially when the vehicle is towing a heavy haul. This system will assure that your vehicle is maintaining ideal traction with the road, and stability will also be increased. The Trailer Sway Control will serve a similar purpose, as drivers can monitor the status of their trailer. Thanks to the accompanying Trailer Brake Controller, drivers can also provide their haul with optimal stoppage power. Speaking of braking, for those who opted for the diesel engine, the Diesel Exhaust Brake System will provide the utmost braking power. It can be especially tough to slow down your vehicle when it’s hauling thousands of pounds, especially when you’re traveling down a hill. Thanks to the Diesel Exhaust Brake System, you won’t have to worry about your truck’s well being. Drivers won’t have any reason to fret when they’re behind the wheel of the 2017 Silverado 3500HD, as the vehicle delivers some of the most reliable and extensive safety functions in the entire industry. For starters, the vehicle will protect occupants in the event of a collision, as the six available air bags will provide the necessary amount of cushion. If help is needed, the OnStar Automatic Crash Response system will automatically connect the driver to an OnStar Advisor, who can subsequently send emergency personnel to your location. Of course, you shouldn’t find yourself in an accident in the first place. Thanks to features like ABS brakes (with accompanying Duralife rotors) and the StabiliTrak Electronic Stability Control System, drivers will always be receiving the utmost in safety, even when road conditions are subpar. Meanwhile, safety technologies like Forward Collision Alert, Lane Departure Warning, Safety Alert Driver Seat, and Front and Rear Park Assist will play a significant role in your pickup avoiding an accident. Of course, it’s important to remember that the four individual pickup trucks provide more than the listed attributes. 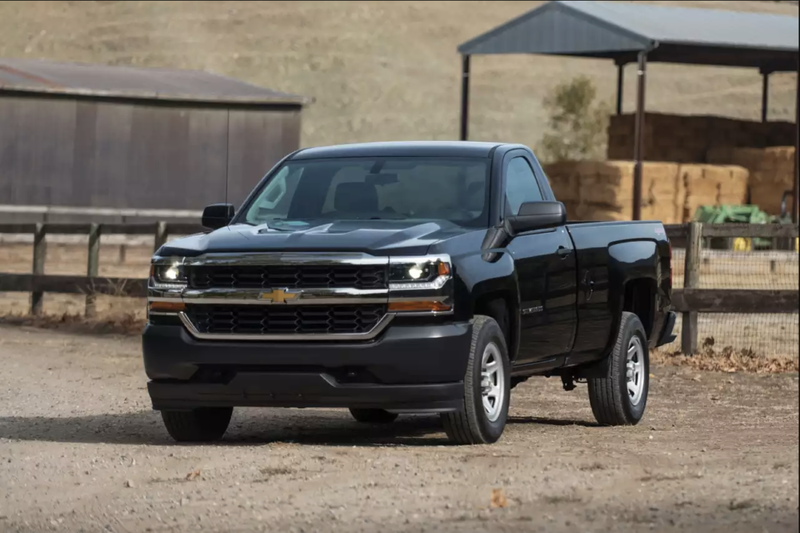 Chevy’s pickups are some of the most versatile offerings in the entire class, and you’ll surely have a tough decision to make when it’s time to seek trucks for sale.